Vinyl sheet flooring offers a wide range of styles and colors – from a classic black and white checkered look to the most modern look in wood and stone. A flooring materials made up of a mixture of polyvinyl chloride and plasticizes, pigments are added for color. 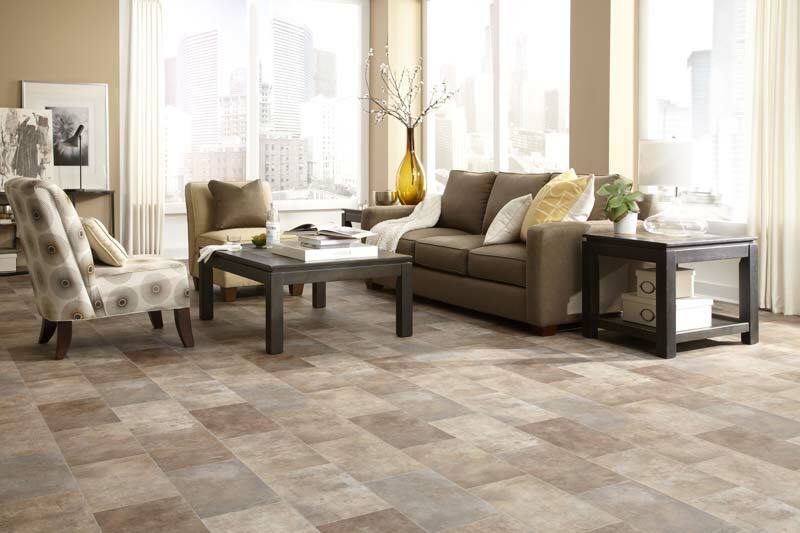 Vinyl flooring us usually flexible; fine textured, and is relatively a non-porous easy cleaning flooring option. Linoleum City has a great selection of in stock vinyl. Available in 6 foot and 12 foot widths. Cut to the length you need to get your project done. Economical and ready for you to take home today. We carry both loose layer and adhesive flooring products and supplies. We have many patterns and colors in stock and if we do not have it, it can be ordered and into our warehouse within 2-3 days. Daily cleaning like sweeping, mopping or vacuuming maintain the shine of vinyl. A cleaning solution is a helpful tool when messes have been sitting a little longer. Commercial grade polishes and sealants are great for larger projects. Some vinyl floors need to be refinished after years of wear and tear but this process is not used as a polish, more for when the original surface has been compromised.